What type of mattress do you have? Studies show that around a third of your life is spent on the bed – either sleeping or doing some other bed-focused activity. Getting the best mattress possible is a sound investment for your comfort and overall well-being, given the amount of time you will spend with the product you choose. 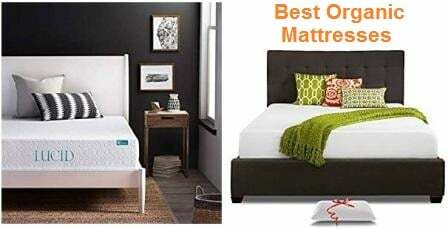 When you talk about getting excellent mattress choices, an organic mattress is your top choice. Conventional mattresses may be exposing you to a variety of harmful chemicals, which are used as flame-retardants. Some of these chemicals are highly toxic, and long-term exposure to these can lead to a host of health issues. Some of the harmful chemicals usually found in traditional mattresses include PBDE (polybrominated diphenyl ether), other brominated flame-retardants, formaldehyde, and VOCs volatile organic compounds. Read our latest guide about the best zinus mattresses. An organic mattress will benefit your well-being in the long run, with materials such as latex foam and wool that most people consider as hypoallergenic. The organic fibers and fabrics used in manufacturing organic mattresses are not treated with chemical dyes, pesticides, or toxic chemicals that can be harmful to your health. Choosing an organic mattress will also help the environment since the materials used do not necessitate the use of herbicides and pesticides. Sustainable materials such as latex, sustainable woods, and organic wool & cotton are also biodegradable and recyclable. Organic mattresses are created with organic fabric and padding – with the most common materials being organic cotton and wool -, and latex foams. Organic latex beds are manufactured using foam from organically-grown latex trees using the Dunlop method of processing. On the other hand, memory foam and hybrid organic mattresses are made with plant-based polyfoam to achieve that unique contouring feature. It should be noted that mattresses can never be considered as 100% organic – the highest level of organic components comprises 95% of the entire product. You may come across some products which are labeled as “eco-friendly” or “green”; this can mean that one stage of the manufacturing process is described as such, without the entire product being purely organic or natural. Organic cotton is grown without the use of harsh pesticides or fertilizers and does not involve genetically-modified organisms. This material – used as mattress fill and as the fabric to cover the mattress itself – results in a comfortable organic mattress that is highly durable. Cotton is hypoallergenic, making it ideal for people with sensitive skin and respiratory conditions. An organic wool mattress is ideal if you want to avoid the discomfort of sleeping on a hot spot on your bed. Wool dissipates excess heat, keeping your mattress cool all the time. This type of organic mattress has minuscule air pockets that improve moisture evaporation and air circulation so you can rest with a drier, cooler feeling. Heat and moisture buildup is prevented with lanolin naturally present in wool. Lanolin is a natural wax that keeps sheep’s hair soft and dry through extreme weather conditions. Typically, wool organic mattresses – which are hypoallergenic for most people – have a shorter lifespan compared to cotton and latex mattresses. Read our complete guide about the best single size memory foam mattresses. Organic latex mattresses are considered to be generally hypoallergenic. Natural latex contains at least 95% rubber sap from the rubber tree, with no harmful additives or chemicals used. The sap is poured using the Talalay or Dunlop process, which result in slightly different finished products. Talalay latex has a bouncier, softer feel, with breathable airholes that result in a mattress that feels cooler to the body. The Dunlop process results in a denser and heavier latex material as a finished product. Organic mattresses are protected from fires with the use of Kevlar, wool layers, silica, or specially-designed silica without the use of harmful chemicals. Traditional mattresses are treated with a host of chemicals that make them fire- and flame-resistant. Studies show that exposure – especially long-term – to these chemicals (such as PBDEs) can pose problems in the thyroid, liver, and other body organs. An organic mattress is naturally hypoallergenic because of the organic materials used in their creation. Most organic mattress covers use organic cotton, which is one of the most hypoallergenic materials in the world. They are made without using harsh pesticides, herbicides, or chemicals that can lead to skin irritations. Organic mattresses are ideal for those who have respiratory problems, those who have allergies, and for young children or infants who have a higher risk of developing skin irritations. Organic mattresses last longer compared to their traditionally-made counterparts. The costlier options which are as close as possible to be 95% organic have more organic components, but these products will also give you the best value for money as they last much longer compared to conventional mattresses. You may notice a harsh chemical smell from the time remove your mattress; protective covering, and this may last for a few more days. The unpleasant smell comes from the chemicals (volatile organic compounds or VOCs) which were used to make the mattress fire-retardant. This smell can be extremely irritating especially to those with sensitive senses of smell, considering that the mattress would just be a few inches away from the face when one lies down. Organic mattresses are manufactured with eco-friendly, sustainable, and biodegradable materials that have not been touched by pesticides, herbicides, or other harsh chemicals. When you choose an organic mattress, you are contributing to keeping the environment safer by reducing your carbon footprint. States that for a product to be called “organic”, at least 95% of it should be made of organic materials. The GOLS certification analyzes finished and organic latex foam products; it states that at least 95% certified organic raw material should be present for the product to be certified. A product with a GOTS organic certification does not necessarily mean that it is USDA organic since their worldwide standards for products are different. A GOTS certification will inform you that the product was manufactured using organic fibers. This certification gives assurance that the organic mattress will not emit any harmful materials (chemicals that may pose health risks or illegal substances). This certification ensures that the organic mattress has very minimal particle and chemical emissions. This certification gives you an idea about the product’s durability, as well as assurances regarding the natural latex content and emission testing results. Seeing this certification would assure you that the product contains certified flexible polyurethane foam made without formaldehyde, lead, mercury, or other heavy metals. This ensures that the product is not harmful to the environment. The certification also addresses several issues related to environmental and social awareness, such as social fairness, renewable energy and carbon management, material health, water stewardship, and material reusing. This certification applies to products that have a minimum of 5% organic cotton and states that the fibers used are 100% organic with no contact (at any point in the processing) with other fibers. Pure Green Natural Latex Mattress – Medium Firmness is made of 100% natural latex foam from Sri Lanka, carrying both Eco-Institut and OEKO-Tex certifications. It is manufactured using the Dunlop process and does not contain synthetic latex foam, blended latex foam, or poly foam. The quilted cover is made of organic New Zealand wool for a breathable cover that keeps the mattress cool and comfortable. Only premium components are used. No polyester fabric, no polyurethane foam, no synthetic latex foam, and no polyester fill. The Pure Green Natural Latex Mattress – Medium Firmness is made of GOTS-certified organic New Zealand wool, GOTS-certified organic cotton, and 100% natural latex foam. All these components have been sewn, assembled, and packaged in the company’s factory in Chicago. 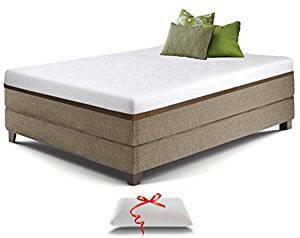 A 6-inch Pure Green 100% natural latex foam layer is placed on the base of the mattress, providing durable and strong support. This base is topped with a soft 2-inch Pure Green 100% natural latex foam layer. The combination of these 2 latex foam layers results in a mattress that provides strong support and the utmost comfort. The mattress cover includes a layer of wool approximately 1-inch in thickness for additional comfort and bulk. The wool’s natural fire-resistant attribute makes it possible for this product to comply with federal flammability standards without using chemical fire barriers or flame-retardants. Features a soft knit cotton fabric cover made from GOTS-certified organic cotton (also used for the quilt backing) that stretches to let you feel the softness of the latex foam layer. The cotton cover has a soft, smooth feel that adds to your supremely comfortable experience every time you lie down on the mattress. The medium firmness is ideal for side sleepers and back sleepers that prefer to rest on a firm mattress. This product has the most popular firmness for mattresses, and it is also for couples who have varying sleep preferences. This product is Greenguard Gold-certified by UL, with no harsh fire retardants or barrier cloths. Ready to be used in minutes, with no assembly required. Upon placing the mattress on your bed frame, you simply need to unroll the plastic wrap to unravel the best organic mattress. The mattress cover is made up of 2 separate pieces, with a heavy-duty zipper to attach the two components together. The cover can conveniently be removed for cleaning whenever necessary, with the zipper easily accessible and ready to be unzipped so you can get to the latex foam inside. Created with the material for the most durable mattresses available – natural latex foam, with covers that are designed for maximum durability. The mattress includes a comprehensive 10-year warranty. This mattress is composed of natural hand-tufted New Zealand wool rosettes, CertiPUR-US foam, and 3.5 inches of gel memory foam. A durable cover made from bamboo-derived rayon can easily be removed for cleaning and maintenance and has not been exposed to harmful chemicals or toxins. The ventilated airflow zone helps keep the mattress cool. The Brentwood Home Cypress Mattress features sustainable natural New Zealand wool which acts as a natural barrier to fire, removes moisture, and keeps you cool – or warm – depending on the season – as it regulates your body temperature. It features a 2-inch thick ventilated airflow zone that enables the mattress to breathe, ensuring that you get a restful sleep as you stay comfortable and cool all through the night. A strong 7.5-inch support base is placed to prevent noise and absorb your weight. This feature also decreases motion transfer so your partner will not be disturbed with your movements. This organic mattress has 3.5 inches of gel memory foam that follows the contours of your body to bring relief to pressure points and keeps your spine in proper alignment. This feature helps you get a great night’s sleep as it contributes to decreased tossing & turning while lying down. 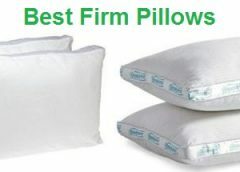 It offers medium firmness, which is great for side, stomach, or back sleepers – ideal for partners who have varying preferences. This mattress is designed for even weight distribution for added comfort. This product is Greenguard Gold-certified non-toxic with low VOC by UL Environment. The Brentwood Home Cypress Mattress is made with only CertiPUR-US foams that do not contain flame retardants, formaldehyde, heavy metals, or phthalates. The removable zippered cover made with New Zealand wool prevents odor while regulating your body temperature. For additional convenience, this item is compressed and rolled-up inside a box for shipping. As a guarantee of quality, the Brentwood Home Cypress Mattress offers a 25-year limited warranty. The My Green Mattress – Natural Escape Medium Firm Mattress is made with 100% natural GOLS-certified organic Dunlop latex. 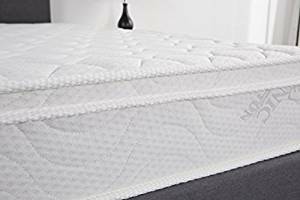 For strong lumbar support, this mattress includes a 1074 L&P 3-zone pocketed coil spring system, with 14.5-gauge nested coils placed across the center third portion of the mattress, along with 15.5-gauge coils positioned at the head and foot parts. For a firmer seating edge, this product is equipped with 13.5-gauge perimeter coils. The next layer is composed of a quilted cover made of soft GOTS-certified organic cotton. The organic cotton layer is supported underneath with 100% natural eco-wool. 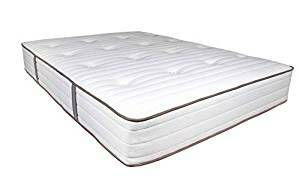 This premium mattress features an innerspring base with 3-zone pocketed coils, which is supported on top with a 3-inch thick 100% GOLS-certified organic Dunlop latex layer. On top of the latex cover is the GOTS-certified organic cotton cover, along with all-natural eco-wool. This product boasts of a button-tufted design that works in keeping the mattress layers secure while providing additional durability. This mattress does not contain synthetic foam. This medium firm mattress has built-in lumbar support in the innerspring base, making sure that your back is always kept in proper alignment and comfort. Enjoy a plush, luxurious sensation courtesy of the organic latex layer. The My Green Mattress – Natural Escape Medium Firm Mattress is ideal for side sleepers, and for those who want to experience utmost comfort while sleeping. This mattress is Greenguard Gold-certified and does not contain any toxic flame retardants. The 100% natural eco-wool sourced from Oregon and California makes it possible for the mattress to follow all the established federal requirements without the need for chemical-based flame retardants or barriers. 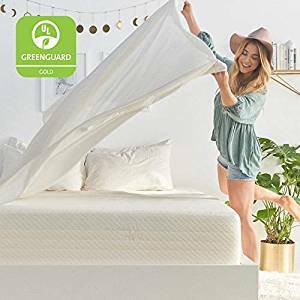 The My Green Mattress – Natural Escape Medium Firm Mattress features handles which are to be used for easy rotating – these handles should not be used to carry or move the mattress itself, as this can lead to damage. This mattress comes with a 10-year warranty plus a 100-night sleep trial. Organic cotton fabric top for a comfortable, plush feeling. This mattress is equipped with a 2-inch organic latex layer for pressure point relief. This product features 8-inch pocketed springs, sewn-in organic wool batting, and organic cotton filling. The Happsy Organic Mattress – Cal King uses certified organic materials. The Happsy Organic Mattress – Cal King is made of environmentally-friendly, certified organic, and sustainably source materials. This product does not contain harsh adhesives, foams, or chemicals that can harm your health and the environment. Under the organic cotton top, this premium mattress features 8-inch pocketed springs that work on absorbing the heat, so it stays away from your body – keeping you cool and comfortable. The pocketed springs also work on reducing motion transfer, so the movements you make will not disturb your partner. Medium firmness ideal for side sleepers. With this mattress, lying on a bed of clouds will seem like a reality with 2 inches of organic latex and organic wool batting. This mattress has a breathable coil system that keeps you cool and comfortable. The moisture-wicking powers of wool keep the heat away from your body so you can have a restful sleep. The organic latex relieves pressure points, so you don’t wake up with aches and pains. The latex also follows your body’s natural contours for complete comfort as you sleep. Certified organic, non-toxic, and fully-compliant with the standards established by the GOLS and GOTS. Does not contain chemical flame retardants, GMOs, pesticides, polyurethane foam, glues & adhesives, or formaldehyde. Made in the USA with imported and domestic components & fabric. The Tuft & Needle King Mattress, Bed in a Box is made with the one-of-a-kind T&N Adaptive Foam, engineered by the company itself. The proprietary foam is combined with a high-quality support layer that offers a durable foundation for the entire mattress. The proprietary T&N Adaptive Foam used in this mattress offers the best features of latex and memory foam, without the disadvantages that come with these materials. The adaptive foam was developed based on customer feedback, and through a partnership with the top foam scientists in the world. This adaptive foam material offers support and comfort in just one material, while these benefits are offered by other bands using two materials (usually latex and memory foam). This mattress consists of only two layers – the base layer that provides support, and the T&N Adaptive foam layer on top. This results in a high-quality, cost-efficient mattress. The T&N Adaptive foam is designed to bring comfort to any type of sleeper, regardless of size. The foam layer reacts by providing more support with increasing pressure or weight. Offers support and plush bounce ideal for all sleeping positions. Localized bounce feature means your partner will not be disturbed when you move. With the Tuft & Needle King Mattress, Bed in a Box, heat is drawn away from your body and into the mattress. A combination of graphite and gel channels the heat outward so it stays away from your body, keeping you cool & comfortable at all times. The foam cells make it possible for air to flow through easily, resulting in speedy heat transfer through the mattress – away from your body. This product is Greenguard Gold-certified, CertiPUR-US-certified, and OEKO-Tex-certified. This mattress does not contain PBDE and has a flame-retardant cover. 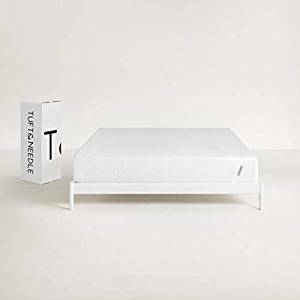 The Tuft & Needle King Mattress, Bed in a Box fits all foundations. The Tuft & Needle King Mattress, Bed in a Box comes with a 10-year limited warranty, with a 100-night sleep trial. This mattress features GOTS-certified heavyweight organic cotton batting on top of a 3-zone pocketed coil innerspring system. The quilted cover is crafted with GOTS organic cotton fabric and all-natural eco-wool. This product offers firm lumbar support with a 1074 L&P 3-zone pocketed coil spring system, featuring 14.5-gauge nested coils placed across the center third portion of the mattress, along with 15.5-gauge coils located at the foot and head parts. This product offers a firmer seating edge, equipped with heavy 13.5-gauge perimeter coils. The My Green Mattress – Pure Echo is created using only hypoallergenic, all-natural materials. The wool used comes from Oregon and California, has no polyester fibers, and is washed in a GOTS organic compliant, mild, biodegradable soap which is alcohol-based. Motion transfer is reduced with the innerspring’s 3-zone pocketed coils, making it possible for your partner to sleep undisturbed even with you moving around the bed. The button-tufted design improves durability while keeping the layers secured together without the need to use adhesives. 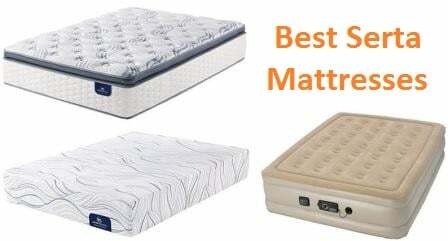 This is a firm mattress ideal for children, teens, and adults. Features a pocketed coil innerspring that fully contours to the body for additional comfort. The innerspring also offers superb lumbar support, so you don’t wake up with aches and pains after a night’s sleep. This mattress is Greenguard Gold-certified, with no toxic flame retardants that can be harmful to your health. The eco-wool used in the cover acts as a natural flam barrier, without the need to use chemical materials to keep the mattress protected from flames. Uses GOTS-certified organic cotton and OEKO-Tex-certified natural wool for the quilted cover. 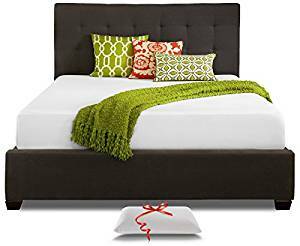 Can be placed on the floor, an adjustable bed case, a platform bed with slats less than 3 inches apart, or on a box spring foundation. The Naturepedic 2-in-1 Organic Cotton Ultra Quilted Mattress features an organic cotton waterproof fabric for its top layer. The bottom layer consists of quilted organic cotton fabric (not waterproof). Organic cotton from USDA-certified sources is used for the filling of this mattress. Includes a high-quality 14.5-gauge steel coil innerspring with alternating coil directions, which gives a supportive and comfortable stable feeling. 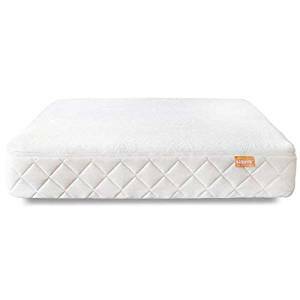 One side of this Naturepedic 2-in-1 Organic Cotton Ultra Quilted Mattress has a polyethylene waterproof surface that meets food contact standards. This surface is stain-resistant, non-toxic, and waterproof. You will not need an additional casing for dust mites or bugs, as this waterproof surface also functions as a barrier to these unwelcome critters. The other side of this mattress has plush quilting of organic cotton fabric, making it easier to transition older children to a more mature mattress experience. It should be noted that this side is no longer waterproof; for protection against dust mites and spills, a waterproof organic protector pad is recommended. This mattress offers a comfortable medium-firm support ideal for children. On the other hand, the quilted side offers a more luxe feel for older children to enjoy. Allergen-friendly design – this mattress has a built-in barrier against bed bugs and dust mites on the waterproof side and on the sides. It is crafted without using soy or latex, which can be potential allergens. This product is Greenguard Gold-certified. The Naturepedic 2-in-1 Organic Cotton Ultra Quilted Mattress is certified by OTCO to the GOTS. No chemical flame retardants and harsh chemicals used. It has passed all federal and state flammability standards through the elimination of polyurethane foam and using natural materials (organic cotton fiber, organic cotton fabric, and non-GMO-plant-based PLA batting) that act as flame barriers. This mattress comes with a 10-year limited warranty. 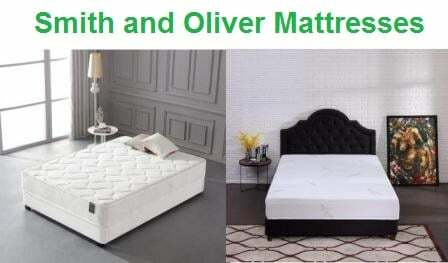 This mattress is crafted with natural latex foam for comfort and support. Individually-encased coils are housed in a supportive foundation for pressure relief. Gel memory foam regulates temperature for a cool & comfortable resting experience. 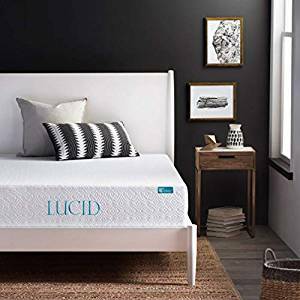 LUCID 10 Inch California King Hybrid Mattress features individually-encased coils that react independently so that you get customized comfort as the mattress enjoys increased airflow. These supportive coils are also responsible for reducing motion transfer, so movements are concentrated in a specific area. Aloe Vera-infused high-quality transition foam creates a calm environment that encourages a relaxing sleep – so you will feel refreshed and invigorated upon waking up. This naturally-hypoallergenic mattress features bamboo charcoal infusions that keep moisture away from your body and eliminates unpleasant odors. Improved edge support ensures that you can enjoy the comfort of your entire bed, regardless of the sleeping position you choose. The LUCID 10 Inch California King Hybrid Mattress comes with a soft breathable cover that enhances the comfortable, relaxing feel of your slumber. The 15-inch layer of gel-infused memory foam embraces your body’s natural contours for that luxe feel. This layer also works for your comfort by relieving pressure points – by keeping your spine properly aligned – while you sleep, or when simply lying down on the mattress. A 1-inch layer of latex, on the other hand, prevents you from sinking too deep into the mattress. This mattress has medium firmness, designed to give complete comfort to all sleep types. 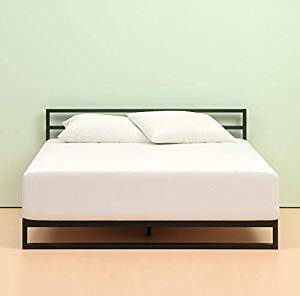 This mattress can be used with a wide variety of bed frames, such as box spring, metal grid, platform, adjustable base, and slatted base – although you will need to make sure that the slats have less than 4 inches of space in between them. This is a CertiPUR-US-certified mattress. The LUCID 10 Inch California King Hybrid Mattress comes with a 10-year warranty. This mattress is fully supported by a base of 8.5 inches of high-density performance core. The Live & Sleep Ultra King Mattress – Gel Memory Foam Mattress features a 12-inch thick design, with a premium memory foam layer which is 2.5 inches thick. A 1-inch thick gel-infused memory foam is added for superior cooling and comfort. A soft breathable cover made of world-class linen offers a cloud-like sensation. The extra-thick 12-inch profile of the Live & Sleep Ultra King Mattress – Gel Memory Foam Mattress gives you a luxury hotel feel, made even plusher with high-quality materials. The responsive 2.5-inch memory foam layer helps relieve pressure points by keeping your spine in a properly aligned position while you sleep. The memory foam envelopes your body in a relaxing hug as you rest in complete comfort. The 1-inch gel-infused cool memory foam keeps your body cool by keeping the heat dispersed away from your skin, preventing mattress hot spots. Ideal for use on an adjustable bed, metal platform, box spring, or hard floor only. This mattress offers a medium-firm feel – a nice balance between hard & soft – that hugs the contours of your body with a welcoming touch. The plush breathable cover is made from a soft linen material that feels cool and comfortable to your skin, so you can have an even more relaxed slumber. The product is CertiPUR-US-certified and OEK-Tex-certified. This mattress is eco-friendly, non-toxic, antimicrobial, and hypoallergenic. The foam used in this mattress has been independently tested for quality and safety. A part of each purchase of Live & Sleep Ultra King Mattress – Gel Memory Foam Mattress goes to charity, so you are helping others while enjoying your comfortable mattress. 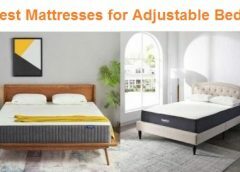 This product is backed by a 30-night, no hassle return policy, along with a 20-year warranty that ensures you will get to enjoy the benefits of your mattress for a long time. The Oliver Smith Organic Cotton 12 Inch Deluxe Sleep features an organic ventilated cotton cover, on top of 6 inches of cooling memory foam. 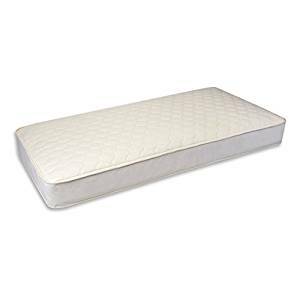 This memory foam layer is supported by 6-inch independent tempered steel pocket spring coils. The organic cotton cover, along with the cooling memory foam, prevents mattress hot spots to ensure that you will have a restful sleep without “overheating” in the middle of the night. The Euro Pillow Top is included for added softness. The certified green foam offers exceptional support even while it conforms to the body’s contours for unparalleled comfort. This foam allows the air to circulate freely, dispersing the heat away from your body so it remains cool as you sleep. The independent pocketed tempered steel spring coils give a customized feel, so the mattress “moves” to accommodate your body’s contours. The bouncy feeling helps give a relaxed feeling with every movement, or while you are at rest on the mattress. This product was designed to reduce motion transfer, so you are assured that your partner will experience only a slight disturbance when you move on your side of the bed. The 15-gauge coils make up the foundation layer, providing more support compared to other mattresses that use thick polyfoam. The coils also help in the even distribution of weight to relieve the discomfort that comes from having pressure points. The Oliver Smith Organic Cotton 12 Inch Deluxe Sleep has a comfortable plush feel, which is ideal for those with back problems. It provides exceptional support to light sleepers. The 12-inch thickness of this mattress provides superb body support, even with only 2 layers. The thick mattress will make you feel like you are suspended in air, giving you a luxurious yet bouncy feeling. 100% certified Green Foam used – no polyfoam. 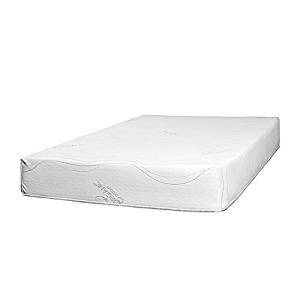 The Oliver Smith Organic Cotton 12 Inch Deluxe Sleep comes with a 20-year warranty. 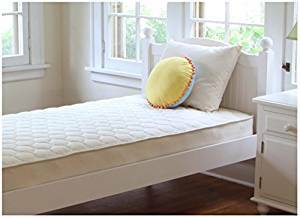 The Best 2 Rest 10-inch Natural Latex Foam Mattress features 2 inches of organic latex as its top layer. Underneath this latex layer sits the 1-inch gel memory foam with strong cooling characteristics. The third layer is made up of 7 inches of high-density foam that provides ample support. The high-density foam and natural latex layers provide ample support and keep your back and spine in proper alignment as you sleep. This means that you will feel refreshed and not sore when you wake up after a few hours of restful sleep. The memory foam layer comfortably conforms to your body’s contours so you can avoid the discomfort caused by pressure points. This layer is also responsible for that feeling of lying on a bed of clouds, made possible with efficient and even weight distribution throughout the mattress. This memory foam layer also works in greatly reducing motion transfer. Your movements will not disturb those who are on the bed with you, as the foam is designed to mold to the individual body – instead of being focused on small movements. 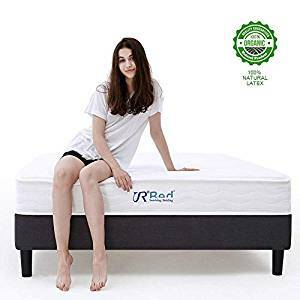 While other memory foam mattresses do not have that bouncy feel, the Best 2 Rest 10-inch Natural Latex Foam Mattress does have that flexibility and bounce that makes the experience more enjoyable. The Best 2 Rest 10-inch Natural Latex Foam Mattress features medium firmness, which is ideal for those who have back issues. The components of this mattress were used with your comfort in mind. The memory foam is infused with a cooling gel to keep the mattress (and you) from overheating. The organic cotton cover and the natural latex layer are both breathable to enhance the airflow in the mattress – ensuring that you do not have to worry about uncomfortable hot spots as you sleep. This mattress is hypoallergenic, made from organic and natural materials – ideal for those who are sensitive or allergic to harsh chemicals/components. This mattress is backed with a 10-year warranty. It may take up to 48 hours for the mattress to take its natural shape after initial setup. Contains some synthetic (polyurethane) material. The top layer of the Zinus Memory Foam 12 Inch Green Tea Mattress features a 3-inch memory foam, infused with green tea extract and ActivCharcoal. The next layer is crafted from 2 inches of comfort foam, followed by a 3.5-inch high-density foam underneath. Lastly, the foundation is composed of a 3.5-inch high-density base support foam. The comfort foam layer enhances sleep efficiency as it eliminates pressure points, so you do not wake up feeling sore after a few hours of sleep. 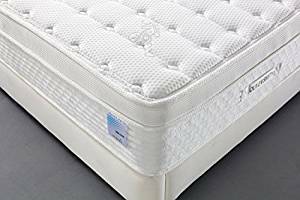 This comfort foam layer adds support to the top memory foam layer, conforming to your body’s contours so your body parts pleasantly “sink” into the softness of the mattress – instead of being uncomfortable with the pressure against the mattress surface. The breathable foam material lets air flow through the mattress to keep you sleeping in complete comfort through the night. You will not have to worry about waking up sweating and feeling overheated after only a few hours of sleep. This product’s memory foam layer maintains proper spine alignment as you sleep, making it an ideal mattress for those with back problems. The Zinus memory foam is infused with natural components, resulting in a responsive sleeping surface that gently cradles your body – it will feel like you are sleeping on a bed of clouds. The pressure-relieving comfort foam layer conforms to your body contours, so your sleep is as comfortable as possible. Zinus Memory Foam 12 Inch Green Tea Mattress is infused with natural green tea extract which works to maintain and prolong the product’s freshness. You will wake up smelling and feeling fresh after getting restful sleep. CertiPUR-US-certified, this mattress is made without harmful chemicals, flame retardants, formaldehyde, or phthalates. This mattress comes with a 10-year limited warranty and a risk-free 100-night trial. The high-density foam layers provide additional support and durability for the entire mattress. This mattress features high-quality 14.5-gauge steel coil innerspring, with alternating coil directions. A 6-gauge border wire offers added durability and support. This product is made with organic cotton fabric and has an organic cotton filling. This mattress feels luxurious with its quilted organic cotton fabric top layer, which provides a more mature mattress feeling. The hypoallergenic cotton is ideal for children who are prone to allergies or sensitivities to harsh chemical components. The filling is made of the purest form of cotton – organic cotton. This is a much healthier option for mattress filling, compared to synthetic foams and fabrics that may contain harsh chemicals. Made without latex or soy, the Naturepedic Organic Quilted Deluxe 1-Sided Mattress is hypoallergenic so you can rest assured that your kids are kept away from these potential allergens as they sleep. The medium firm support of this mattress is ideal for the sleeping comfort of children. Guaranteed durability can withstand the young ones’ never-ending energy reserves. An elegant quilted organic cotton layer offers a more luxurious feel that will keep your child resting more comfortably. 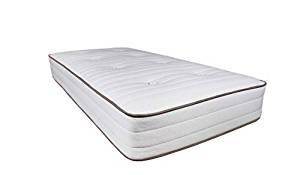 The Naturepedic Organic Quilted Deluxe 1-Sided Mattress has passed all the necessary federal and state flammability standards with only the use of natural materials, such as organic cotton fiber, organic cotton fabric, and non-GMO PLA batting. This product is created without chemical flame retardants or flame barriers. Greenguard Gold-certified, with all of the components guaranteed to be non-toxic to the health. This mattress is certified by OTCO to the GOTS (Global Organic Textile Standard). Naturepedic uses only certified organic, US-grown cotton for their mattress filling, with the cotton supplied only by USDA-certified sources. This provides much-needed support for US farmers and increases the mattress’ organic reliability & purity. The top cover of this mattress is made of luxurious cashmere wool. It is enhanced with a fabric which is the same material used in bulletproof vests. Only 100% natural Talalay latex from Thailand is used for the bouncy latex layer on top. The bottom layer is equipped with independent pocket springs made of tempered steel, with a total of 825 coils used for this mattress. Four lines of 2.2mm diameter steel coils are integrated into this mattress for enhanced edge support. The Talalay latex used in creating this product has a more plush, softer profile compared to Dunlop latex, with these features consistent all throughout the entire mattress. These features of Talalay latex make this mattress ideal for sleepers of all sizes. The latex layer helps relieve pressure points so you can sleep through the night in complete comfort. Latex is highly elastic and conforms to your body shape and contours as you sleep. This latex layer also helps keep the heat away from your body so you will not wake up with an overheated, sweaty feeling. The coil pocketed spring support base offers a strong foundation that ensures your mattress will not sag or sink within a few years. Enjoy superbly reduced motion transfer, as the individually-wrapped springs work quietly to ensure that your partner will not be disturbed by your restless movements through the night. Lie down on a high-quality cashmere top layer and enjoy this luxury that feels softer than sheep’s wool. Cashmere also enhances your comfort by keeping heat away from your body during summer and keeping you 7x warm in winter. Firm cushion feels – enhanced by the naturally bouncy Talalay latex layer – makes this mattress ideal for side, back, or stomach sleepers. This latex coil hybrid mattress can fit the following bed frame types: platform, box spring, slats, trundle beds, bunk beds; not suitable for adjustable beds. This product contains 100% natural latex, which is healthy for you and the environment. It is a natural deterrent against mites, germs, and allergens. This mattress is backed by a 20-year warranty and a 120-night sleep trial. The top layer of this 12-inch thick mattress features a soft breathable material to complement the memory foam layer. 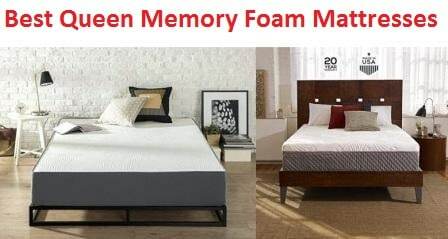 The 2.5-inch thick premium memory foam layer sits on top of the 1-inch gel memory foam layer that enhances the temperature regulating power of this mattress. A high-density, 8.5-inch thick performance core support base provides strong support to the entire mattress, and for your body as well. The breathable cover is created with a soft fabric that gently hugs your body’s contours, giving you that welcoming feeling as you lie down and prepare for a good night’s sleep. The premium memory foam layer offers efficient pressure point relief so you can have a restful sleep throughout the night, with reduced moments of tossing & turning as you seek a comfortable position. This layer works by keeping the spine properly aligned even through several hours of sleeping, leaving you feeling refreshed upon waking up. The gel-infused memory foam helps keep the mattress (and you) cool by dispersing the heat away from your body. A 12-inch thick profile of this mattress can give your bedroom a luxury hotel room feel. The Live & Sleep King Size Mattress Gel Memory Foam has a medium-balanced firmness, ideal for those who sleep on their stomach, back, or side. Each purchase of a Live & Sleep King Size Mattress Gel Memory Foam gives you the chance to help others, with a part of each purchase going to a designated charitable institution. The Live & Sleep King Size Mattress Gel Memory Foam is backed by a 30-night, no hassle return policy, along with a 20-year warranty. The LUCID 10 Inch Plush Memory Foam Mattress is protected by a TENCEL lyocell blend cover, crafted using an eco-friendly process. A contouring gel-infused memory foam is designed to conform to the contours of your body. A 7-inch supportive foam base layer offers support for large frames. The eco-friendly TENCEL cover feels luxuriously soft on your skin. This cover also provides additional cooling, with its breathable properties allowing air to circulate more freely between your body and the mattress. The contouring memory foam layer allows you to have a restful sleep without having to toss and turn because of painful pressure points. The gel infusion contributes to the cooling effect that prevents hot spots that can disrupt your sleep. As you sleep on your stomach, back, or side, your body will be contoured lovingly by this gel-infused memory foam layer. The supportive base foam layer is a great base foundation for your mattress. This layer is also responsible for keeping your spine aligned properly as you sleep, relieving pressure points and ensuring that you wake up refreshed – and not aching all over. With its medium-firmness, this mattress is ideal for those who sleep on their side. The plush profile of this mattress reduces motion transfer, so your movements will not disturb your partner throughout the night. 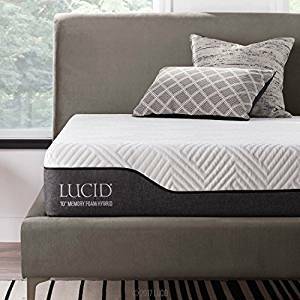 The 10-inch thick LUCID Plush Memory Foam Mattress works very well with an adjustable bed base, which is not only for hospital use, as this type of bed frame can give you the customization you need for a perfectly relaxing sleep. The foam used in this mattress is CertiPUR-US-certified. It does not contain natural or synthetic latex. The mattress has been crafted without mercury, formaldehyde, PBDEs, ozone depleters, and phthalates. This mattress comes with a 10-year warranty. The top layer is a ventilated cooling cover made of organic cotton. The next layer of this mattress features a cooling memory comfort foam. Under the memory foam lies independently-encased tempered steel coils that provide ample support for the mattress, and for your body. The cover of the LIFE Home Oliver Smith Organic Cotton 14-Inch Deluxe Sleep Mattress is crafted with organic cotton, with a revolutionary ventilated fabric design that keeps you feeling cool all through the night as you sleep. The memory foam layer also helps in regulating the temperature, so you do not have to toss and turn during the night, because of hot spots that have formed on the mattress surface. The certified non-toxic green foam moves the heat away from your body and disperses it outwards. A relaxing, bouncy feeling is achieved through the individually-encased tempered steel coils, which move independently following your movements. These coils also ensure that there is very minimal motion transfer; your partner will not be disturbed even by your restless movements throughout the night. Sleep in complete comfort with the help of the mattress’ tempered steel coils. Which effectively work by relieving pressure points. The comfort plush feel of this product makes it ideal for those who have back problems. This thick 14-inch mattress will make you feel like you are sleeping on a bed made of clouds and gives you a welcome bounce that can help lull you to a restful slumber. The LIFE Home Oliver Smith Organic Cotton 14-Inch Deluxe Sleep Mattress has a multi-layered design that offers you a superb sleeping experience without the exorbitant cost. Made with 100% certified Green foam – the highest-rated foam that is non-toxic. 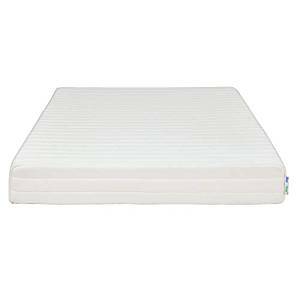 This LIFE Home Oliver Smith Organic Cotton 14-Inch Deluxe Sleep Mattress comes with a 20-year warranty. This 10-inch thick Live & Sleep Classic Twin Mattress is protected by a stretch knit cover with breathable properties. The top layer is made of 2.5 inches of premium memory foam. The support core layer is crafted from 7.5 inches of a high-density support core base. The breathable cover fabric helps keep your body comfortable and cool, drawing heat and moisture away from your skin so you can have a good night’s sleep. Pressure points are relieved with the high-quality memory foam layer that works by keeping your spine in a properly-aligned position, even as you remain in one position when you sleep for several hours each night. Say goodbye to nights of tossing & turning and wake up to a fully-recharged feeling that only a restful night’s sleep can bring. Live & Sleep uses Advanced Smart Form technology to bring you a product that is rolled and sealed in a bag, so you can have a top-quality bed-in-a-box that is easy to set up. Medium firmness makes this mattress ideal for all sleep positions or styles, ensuring a good night’s sleep regardless of the position you sleep in. This mattress can relieve back pain by comfortably cushioning sore shoulders and hips. A part of each purchase of this Live & Sleep Classic Twin Mattress goes to a charitable institution, so you do your part in helping others. Live & Sleep mattresses are sold without middlemen and no retailer markup, ensuring that customers get the right price for the premium mattress products. This product comes with a 30-night no-hassle return policy and a 20-year warranty for your peace of mind. The top layer of the Modway Aveline 6-Inch Gel Infused Memory Foam Twin Mattress features gel-infused memory foam. This memory foam layer is cradled by 3 inches of gel-infused foam, followed by a 7-inch dense polyurethane base. This mattress is protected by a stretch knit fabric cover that closes with a zipper, to ensure that the foam stays intact inside. The open cell memory foam offers excellent cooling, so your body stays comfortable throughout the night. During hot or humid weather, this layer dissipates body heat so you can have a restful sleep without waking up bathed in sweat. The gel-infused layer keeps your body cradled comfortably by quickly conforming to your body’s sleeping position and weight. Constructed with only high-quality materials, this product minimizes motion transfer; you can rest assured that your partner will not be disturbed with every movement you make during the night. With just the right blend of hardness and softness, this medium firm mattress is ideal for all types of sleepers. This mattress helps you sleep in complete comfort by reducing pressure on your neck, head, and spine through its open cell memory foam attributes. As you sleep, your spine is kept in proper alignment, so you wake up feeling reinvigorated – without the aches and pains of fitful sleep. 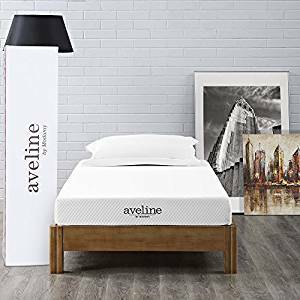 This Modway Aveline 6-Inch Gel Infused Memory Foam Twin Mattress is CertiPUR-US-certified. It is love on VOCs, and manufactured without PBDEs, TDCPP or TCEP flame retardants, formaldehyde, mercury, lead, or other heavy metals. This organic hybrid mattress features an organic cotton cover and a Euro top for superb softness. The support comes from 500 independently encased 15-gauge tempered steel coils. In between the cover and the steel coils, a layer with polyester and quality foam is placed to enhance comfort. This multi-layered Oliver Smith Organic Cotton Revitalize Sleep Luxury Mattress is crafted to provide you with the most restful sleep possible, at an affordable price. The organic cotton cover protects the entire mattress, and at the same time ensures that you will stay cool while you sleep at night. This means you can say goodbye to waking up in the middle of the night while bathed in sweat. The breathable cotton cover allows air to circulate freely through the mattress, so heat is directed away from your body. A 3-inch Euro top padding is placed for extra comfort, hugging your body’s contours while you recharge with sleep. The tempered steel coils quickly conform to your body’s weight and movement, producing that calming bounce that can work on lulling you to sleep. This bouncy motion also contributes to the sensation of being suspended, or sleeping, on air. Independently-encased 15-gauge coils reduce motion transfer so your movements do not radiate outwards from your position and will not disturb your partner. The Oliver Smith Organic Cotton Revitalize Sleep 8 Inch Luxury Mattress features a comfortable plush firmness that is ideal for all sleeping positions. It is also great for those who have back problems. This product was made with comfort in mind, using materials that are designed to draw heat away from your body. Made with 100% certified Green foam, which has the highest rating among non-toxic foam materials. A 20-year warranty comes with every purchase of an Oliver Smith Organic Cotton Revitalize Sleep 8 Inch Luxury Mattress.